When I was growing up, I was fascinated by chiming clocks, and always fancied a real grandfather clock. But the three clocks whose stories I’m about to relate are rather less grand. At home in Markby Road (Birmingham) we had what Dad called his grandmother clock. It had a four foot tall black case in art deco style, and a circular face with Roman numerals. It stood in the corner of our front room (the ‘parlour’) on the right hand side of the fireplace (see photo, taken in 1936). Dad said he acquired it before the war by collecting cigarette vouchers. As he was a heavy smoker, this probably didn’t take him long! The clock had an eight-day spring-driven mechanism and a soft “bong” chime that struck every half hour. Dad went through the weekly ritual of resetting the time and winding up the clock and striking mechanisms. I don’t recall it keeping very good time, but its tick-tock sound and its regular chime were somehow comforting. 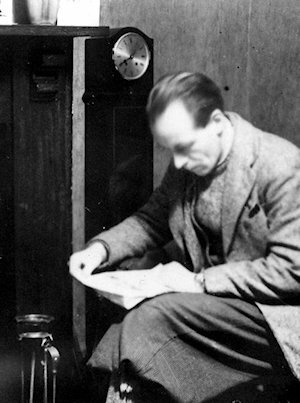 After Dad died in 1961, the clock remained in the same corner of the front room at Markby Road for years, although by this time we rarely wound it up. It came with us in 1971, when we moved with Mom to a maisonette in Selly Oak. The following year, my brother Richard married and soon the clock was installed in his new house on the outskirts of Redditch in Worcestershire. He had the clock cleaned and serviced, and for while it ticked and chimed away happily in Rich and Mary’s living room, surviving two further house moves. Sadly, the old clock has not been working properly for several years, but it is still a prominent feature in Richard’s home office (right). The second clock is a spring-driven chiming Edwardian or late Victorian Gothic style wall clock originally owned by my Dad’s parents, my Grandma and Grandpa Ball. I do not know how or when they acquired it, but I remember seeing it at their home in Ivy Road, Handsworth in the 1940s and ’50s. Grandpa died in 1942, but Grandma stayed on at Ivy Road with her daughter, my Aunt Alice, until her death in 1957. Aunt Alice and her husband then sold the Ivy Road property and moved to a stone bungalow near Ciliau Aeron in a remote part of Cardiganshire. The clock went with them and stayed with them, even after they moved in the early 1970s to a flat in the coastal town of Aberaeron. Alice was widowed in 1975, and she herself died 12 months later. She spent the final year of her life, accompanied by the clock, in a council flat near Aberaeron harbour. On Aunt Alice’s death in 1976, the clock was passed on to her sister-in-law, my mother, at her home in Selly Oak, Birmingham. Mom mounted the clock on the wall of the entrance hall in her maisonette, but the clock never seemed happy there. Its eight-day clockwork mechanism kept stopping despite being wound up regularly. One day, during one of my visits to Mom from my home in Ystalyfera, South Wales, she asked if I’d take the clock back to Wales with me and see if I could get it going. I removed the clockwork mechanism, immersed it in petrol, and left it overnight. By the next morning a black sediment had collected at the bottom of the liquid. I put drops of 3-in-1 oil on the mechanism, carefully replaced it in the wooden case, adjusted the chime and hung the clock on the wall in the hallway (see photo). Lo and behold, it began ticking and ran for its full eight days. Furthermore, the chiming mechanism worked, too! It took a few days for me to adjust the length of the pendulum, but from then on the clock kept excellent time, accurate to within a few minutes per week. Mom told me to keep the clock as it was obviously meant to stay at my home. Twenty years later, when I sold my home in Ystalyfera, the clock was still working well and keeping good time. It even survived a severe trauma in 2000, when it fell off the wall and crashed onto the floor! The mechanism was unharmed, and I was able to repair the minor damage to the wooden case. When I left Ystalyfera, I put the clock and other belongings into a secure storage container, where they remained for nine months, until Helen and I moved into our permanent home in Brecon. Here in Brecon, the clock has tick-tocked and chimed contentedly on the wall of our dining room ever since. It still keeps good time, and still runs for at least eight days on one winding. The latest clock to grace our home is a gravity-driven, wall-mounted cuckoo clock (see photo). The clock was originally acquired by Helen’s mother at an auction in Nova Scotia in the 1940s or ’50s, and hung in the dining room of the family home for years. Helen recalls her father resetting the weights first thing every morning. After his death the cuckoo clock was seldom wound and in about 1969 Helen’s mother packed the clock away in a cardboard box, protected only by some crumpled sheets of newspaper. Sometime in the 1970s Helen received the clock, still in its cardboard box. It remained with her through several changes of address over the years in various storage cupboards until we unpacked it this spring. During a visit in April, we opened the box, removed the old newspaper and I examined the clock. It had survived remarkably well, apart from a missing piece of decorative fretwork. I was convinced we had a good chance of being able to get it working again. We brought the clock’s two weights home to Brecon with us and resolved to bring the rest of the clock next time. Thus it was that when we visited Ottawa last month, we wrapped the cuckoo clock carefully in bubble-wrap, placed it in a suitcase together with clothes and other odds and ends, and checked it in for the flight home from Ottawa. Last weekend, a few days after arriving home, I unwrapped the old clock for the last time, cleaned it, oiled the mechanism, rethreaded the chains, hung it on the wall, and attached the pendulum and weights. After spending nearly 50 years in hibernation, the old cuckoo clock burst into life. It took only a few hours to adjust the pendulum so the clock would run at the correct speed. The mechanism doesn’t quite run for the full 24 hours before the weights reach the floor! Now I have to reset them twice a day. But best of all, the ‘cuckoo… cuckoo…’ sound echoes round our dining room every half hour, day and night. Helen says that as well as evoking memories of home, the sound of the cuckoo clock reminds her of a series of sketches called The Clockmaker written in the 1830s by Thomas Chandler Haliburton, a satirical humorist from Nova Scotia. The sketches feature Sam Slick of Slickville, Connecticut, a Yankee clock-peddler who accompanies a visiting English gentleman on an unforgettable tour of early nineteenth century Nova Scotia. The sketches may be downloaded (free) from the Gutenberg.org website. 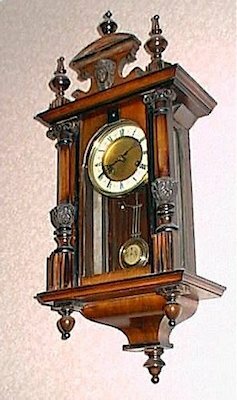 I began this blog by describing my life-long fascination with clocks and my ambition to own a grandfather clock, but the two clocks in our dining room here in Brecon more than make up for the absence of a grandfather clock!